As of June 30, 2015 (the last business day of the Registrant’s most recently completed second fiscal quarter), the aggregate market value of voting stock held by non-affiliates of the Registrant was approximately $1.6 billion. As of February 17, 2016, there were 26,201,818 shares of the Registrant’s common stock outstanding. Portions of the Registrant’s Proxy Statement for its 2016 Annual Meeting of Shareholders are incorporated by reference to Part III of this Annual Report on Form 10-K.
Certain of these factors and others are described in the discussion on risk factors that appear in Part I, Item 1A. “Risk Factors” of this Annual Report on Form 10-K and uncertainties detailed in this and other reports and filings with the Securities and Exchange Commission (SEC). Other unknown or unpredictable factors also could have material adverse effects on our future results. We cannot guarantee future results, levels of activity, performance or achievements. Accordingly, you should not place undue reliance on these forward-looking statements. Finally, we expressly disclaim any intent or obligation to update any forward-looking statements to reflect subsequent events or circumstances. Proto Labs, Inc. was incorporated in Minnesota in 1999. The terms “Proto Labs,” the “Company,” “we,” “us,” and “our” as used herein refer to the business and operations of Proto Labs, Inc. and its subsidiaries. We are a leading online and technology-enabled, quick-turn, on-demand manufacturer of custom parts for prototyping and short-run production. We manufacture parts for product developers and engineers worldwide, who are under increasing pressure to bring their finished products to market faster than their competition. We utilize injection molding, computer numerical control (CNC) machining and 3D printing to manufacture custom parts for our customers. Our proprietary technology eliminates most of the time-consuming and expensive skilled labor conventionally required to quote and manufacture parts. Our customers conduct nearly all of their business with us over the Internet. We target our products to the millions of product developers and engineers who use three-dimensional computer-aided design (3D CAD) software to design products across a diverse range of end-markets. We have established our operations in the United States, Europe and Japan, which we believe are three of the largest geographic markets where these product developers and engineers are located. We believe our use of advanced technology enables us to offer significant advantages at competitive prices to many product developers and engineers and is the primary reason we have become a leading supplier of custom parts. In each of these instances, we believe our solution provides product developers and engineers with an exceptional combination of speed, competitive pricing, ease of use and reliability that they typically cannot find among conventional custom parts manufacturers. Our technology enables us to ship parts as soon as the same day after receipt of a customer’s design submission. Our manufacturing product lines currently include injection molding (Protomold), CNC machining (Firstcut) and 3D printing (Fineline). We continually seek to expand the range of size and geometric complexity of the parts we can make with these processes, to extend the variety of materials we are able to support and to identify additional manufacturing processes to which we can apply our technology in order to better serve the evolving preferences and needs of product developers and engineers. We have experienced significant growth since our inception in 1999. We have grown our total revenue from $98.9 million in 2011 to $264.1 million in 2015. We have grown our income from operations from $26.9 million in 2011 to $67.1 million in 2015. Lathe-turned parts that expanded the breadth and scope of our CNC product line in 2015. Early in the product development process, 3D printing processes such as stereolithography can be used to quickly produce an approximate physical representation of a part, but these representations may not meet product developers’ and engineers’ requirements for dimensional accuracy, cosmetics or material properties. As an alternative, 3D printing processes such as selective laser sintering and direct metal laser sintering or CNC machining can be used to produce low volumes of high-quality custom parts in either metal or plastic. For follow-on functional testing, market evaluation and production runs, parts are typically manufactured using injection molding. Our web-based interface and proprietary software automate many of the manual and time-consuming processes typically required to obtain custom 3D-printed, CNC-machined or injection-molded parts from conventional suppliers. Our platform automates many aspects of the entire process from design submission through manufacturability analysis and feedback, quotation, order submission, mold design, tool path generation and mold or part manufacture. To utilize our platform, a prospective customer uploads a 3D CAD file of their required part through our website. Often within minutes of design submission, our software analyzes the manufacturability of the part, assesses our ability to make the part, and returns a firm price quotation with any recommendations for design modifications. In the case of CNC machining, this manufacturability analysis identifies features that may be too fragile to be machined and areas that cannot be machined at all. For injection molding, problematic features such as undercuts, thin areas, thick areas and areas requiring geometry adjustments to allow the part to be ejected from the mold are identified. Many of our customers find this analysis particularly helpful, as it diagnoses and prevents potential problems prior to manufacturing. We can also provide a flow analysis to identify parts that may be so thin and large that plastic will solidify before the mold can be completely filled. Our manufacturability analysis plays a significant role in our automated pricing algorithms. Our proprietary, highly scalable quoting technology addresses the manual processes conventionally involved in submitting a design, analyzing its manufacturability, making design revision recommendations and generating price quotations. This enables us to quickly analyze high volumes of 3D CAD part design submissions and provide feedback to our prospective product developer and engineer customers. In 2015 alone, we generated quotations for over 550,000 design submissions. Our proprietary manufacturing automation technology is also highly scalable, enabling us to process large numbers of unique designs and, combined with our manufacturing processes, efficiently and effectively manufacture high volumes of parts to meet the needs of product developers and engineers. Our 3D Printing (Fineline), CNC Machining (Firstcut) and Injection Molding (Protomold) product lines offer many product developers and engineers the ability to quickly and efficiently outsource their quick-turn custom parts manufacturing. See Item 7. “Management’s Discussion and Analysis of Financial Condition and Results of Operations” for the historical revenue generated by each of 3D Printing (Fineline), CNC Machining (Firstcut) and Injection Molding (Protomold). Our 3D Printing (Fineline) product line includes SL, SLS and DMLS processes, which offers customers a wide-variety of high-quality, precision rapid prototyping and low volume production. These processes create parts with a high level of accuracy, detail, strength and durability. 3D Printing is well suited to produce small quantities, typically in the range of one to 50 parts. Our CNC Machining (Firstcut) product line uses commercially available CNC machines to cut plastic or metal blocks into one or more custom parts based on the 3D CAD model uploaded by the product developer or engineer. Our efficiencies derive from the automation of the programming of these machines and a proprietary fixturing process. The CNC Machining (Firstcut) product line is well suited to produce small quantities, typically in the range of one to 200 parts. Our Injection Molding (Protomold) product line uses our 3D CAD-to-CNC machining technology for the automated design and manufacture of thermoplastic, metal or liquid silicone injection molds, which are then used to produce custom injection-molded parts on commercially available equipment. Our Injection Molding (Protomold) product line is used for prototype, on-demand and short-run production. Prototype quantities typically range from 25 to 100 parts. Because we retain possession of the molds, customers who need short-run production often come back to Proto Labs’ Injection Molding product line for additional quantities typically ranging up to 10,000 parts or more. They do so to support pilot production for product testing or while their tooling for high-volume production is being prepared, because they need on-demand manufacturing due to disruptions in their manufacturing process, because their product will only be released in a limited quantity or because they need end-of-life production support. These additional part orders typically occur on approximately half of the molds that we make, typically accounting for approximately half of our total Injection Molding (Protomold) revenue. The process for 3D Printing (Fineline), CNC Machining (Firstcut) and Injection Molding (Protomold) begins when the product developer or engineer uploads one or more 3D CAD models representing the desired part geometry. Our proprietary software uses complex algorithms to analyze the 3D CAD geometry, analyze its manufacturability and support the creation of an interactive, web-based quotation containing pricing and manufacturability information. A link to the quotation is then e-mailed to the product developer or engineer, who can access the quotation, change a variety of order parameters and instantly see the effect on price before finalizing the order. For 3D Printing (Fineline), the quote is reviewed and then scheduled for production. For CNC Machining (Firstcut), the tool paths are then reviewed and routed to our high-speed CNC machining centers for execution. In the case of Injection Molding (Protomold), our proprietary software supports the creation of the mold design and the tool paths required to manufacture the mold components, which are then routed to our CNC machining centers for execution. Once the mold is assembled, it is placed in one of our injection molding presses to create the required parts. For our CNC Machining (Firstcut) product line, we ship parts as soon as the same day as the order is received. For our Injection Molding (Protomold) and 3D Printing (Fineline) product lines, we ship parts in as little as one business day from design submission. We ship our parts via small parcel common carriers on standard terms and conditions. We believe there may be opportunities to grow by identifying and expanding into select additional geographic markets. We currently operate in the United States, Europe and Japan, where we believe a substantial portion of the world’s product developers and engineers are located. We entered the European market in 2005 and launched operations in Japan in 2009. For 2015, revenue earned in these markets represents approximately 21% of our total revenue. While we currently do not have specific plans to expand into any particular geographic markets, we believe opportunities exist to serve the needs of product developers and engineers in select new geographic regions and we will continue to evaluate such opportunities if and when they arise. We seek to identify additional manufacturing processes to which we can apply our technology and expertise to meet a greater range of product developers’ and engineers’ needs. Introducing new manufacturing processes can both attract new customers and provide us with a significant opportunity to cross-sell our existing product lines to our existing customer base. We regularly evaluate new manufacturing processes to offer product developers and engineers and introduce such new processes when we are confident that a sufficient market demand exists and that we can offer the same advantages our customers have come to expect from us. See Item 6. “Selected Financial Data” for disclosure of our historical research and development expenses. Examples of new manufacturing processes we have added include CNC Machining (Firstcut), 3D printing through the acquisitions of FineLine and Alphaform and the launch of liquid silicone rubber injection molding and lathe-turned parts. Our CNC Machining (Firstcut) product line was first introduced in the United States in 2007 and has grown to represent 28% of our total revenue in the year ended December 31, 2015. In April 2014, we added 3D-printing technologies through our acquisition of FineLine and further expanded our 3D printing capabilities in October 2015 through our acquisition of Alphaform. During 2014, we introduced liquid silicone rubber injection molding and in February 2015, we introduced lathe-turned products to further expand our product offerings. We regularly analyze the universe of customer design submissions that we are currently unable to manufacture and focus a portion of our research and development efforts to expand the range of parts that we can produce. Since we first introduced our Injection Molding (Protomold) product line in 1999, we have steadily expanded the size and geometric complexity of the injection-molded parts we are able to manufacture, and we continue to extend the diversity of materials we are able to support. Similarly, since first introducing our CNC Machining (Firstcut) product line in 2007, we have expanded the range of part sizes, design geometries and materials we can support. As we continue to expand the range of our existing process capabilities, we believe we will meet the needs of a broader set of product developers and engineers and consequently convert a higher number of quotation requests into orders. Our international marketing effort generates prospects for our sales teams and seeks to strengthen our reputation as an industry leader in rapid custom prototyping and low-volume manufacturing. Since we are an agile, technology-based company, much of our marketing activities occur online. We use marketing automation software to enhance the productivity of our marketing and sales teams and continuously track the results of every campaign to ensure our return on investment. In our Cool Idea! Award program, we grant up to $250,000 in manufacturing services annually to entrepreneurs with innovative ideas. In addition to supporting entrepreneurs and creative product development, we feel this program generates good will, press coverage and word-of-mouth brand awareness. We maintain an internal sales team trained in the basics of part design and the capabilities of our manufacturing product lines, as well as the key advantages of our product lines over alternate methods of custom parts manufacturing. We organize our sales team into complementary roles: business development, account management and strategic account management, with the former focused on selling to new customer companies and the latter two focused on expanding sales within existing customer companies. We believe our sales staff is adept at researching customer companies and networking to find additional product developers and engineers who may have a need for our products. We also have a team of customer service engineers who can support highly technical engineering discussions with product developers and engineers as required during the sales process. Our revenue is generated from a diverse customer base, with no single customer company representing more than 2% of our total revenue in 2015. Capacity: ability to manage peaks in demand. Our patents have expiration dates ranging from 2022 to 2032. We also owned approximately 13 registered and 2 pending United States trademarks or service marks as of December 31, 2015, with corresponding registered protection in Europe and Japan for the most important of these marks such as PROTO LABS, PROTOMOLD, FIRSTCUT, PROTOQUOTE, FIRSTQUOTE, PROTOFLOW and FINELINE, corresponding approved protection in Canada for PROTO LABS, FIRSTCUT and FINELINE, and corresponding registered protection in Australia, Canada and Mexico for PROTOMOLD. There can be no assurance that the steps we take to protect our proprietary rights will be adequate or that third parties will not infringe or misappropriate such rights. We have been subject to claims and expect to be subject to legal proceedings and claims from time to time in the ordinary course of our business. In particular, we may face claims from third parties that we have infringed their patents, trademarks or other intellectual property rights. Such claims, even if not meritorious, could result in the expenditure of significant financial and managerial resources. Any unauthorized disclosure or use of our intellectual property could make it more expensive to do business and harm our operating results. As of December 31, 2015, we had 1,549 full-time employees. We consider our current relationship with our employees to be good. We also regularly use independent contractors and other temporary employees across the organization to augment our regular staff. We believe that our future success will depend in part on our continued ability to attract, hire and retain qualified personnel. Our principal executive offices are located at 5540 Pioneer Creek Drive, Maple Plain, Minnesota 55359 and our telephone number is (763) 479-3680. Our website address is www.protolabs.com. Information on our website does not constitute part of this Annual Report on Form 10-K or any other report we file or furnish with the SEC. We provide free access to various reports that we file with or furnish to the SEC through our website as soon as reasonably practicable after they have been filed or furnished. These reports include, but are not limited to, our Annual Reports on Form 10-K, Quarterly Reports on Form 10-Q, Current Reports on Form 8-K and any amendments to these reports. Our SEC reports can be accessed through the investor relations section of our website or through the SEC’s website at www.sec.gov. Robert Bodor. Dr. Bodor has served as our Vice President/General Manager - Americas since January 2015. From July 2013 to January 2015, Dr. Bodor served as our Chief Technology Officer. From December 2012 to June 2013, Dr. Bodor served as our Director of Business Development. Prior to joining Proto Labs, from January 2011 to December 2012, Dr. Bodor held several roles at Honeywell, most recently leading SaaS business offerings for Honeywell’s Life Safety Division..
Donald G. Krantz. Dr. Krantz has served as our Executive Vice President and Technology Officer since January 2015. From January 2007 to January 2015, Dr. Krantz served as our Chief Operating Officer. From November 2005 to January 2007, Dr. Krantz served as our Vice President of Development. Dr. Krantz was an Engineering Fellow at Alliant Techsystems and Honeywell, Inc., and was named the 2005 Distinguished Alumnus of the Department of Computer Science and Engineering at the University of Minnesota. Jacqueline D. Schneider. Ms. Schneider has served as our Vice President of Global Sales since January 2015. From February 2007 to January 2015, Ms. Schneider served as our Vice President of Sales and Customer Service. In particular, we plan to increase our research and development efforts and to continue to focus a significant portion of those efforts to further develop our technology in areas such as our interactive user interface and manufacturing processes, potentially introduce new manufacturing processes within the research and development initiative we refer to as Protoworks, and broaden the range of parts that we are able to manufacture. We believe successful execution of this part of our business plan is critical for our ability to compete in our industry and grow our business, and there are no guarantees we will be able to do so in a timely fashion, or at all. Broadening the range of parts we offer is of particular importance since limitations in manufacturability are the primary reason we are not able to fulfill many quotation requests. There are no guarantees that the resources devoted to executing on this aspect of our business plan will improve our business and operating results or result in increased demand for our products and product lines. Failures in this area could adversely impact our operating results and harm our reputation and brand. Even if we are successful in executing in these areas, our industry is subject to rapid and significant technological change, and our competitors may develop new technologies, processes and product lines that are superior to ours. Our research and development costs were approximately $18.4 million, $16.6 million and $11.9 million for the years ended December 31, 2015, 2014 and 2013, respectively, and there is no guarantee that these costs will enable us to maintain or grow our revenue profitability. Refer to Item 7. “Management’s Discussion and Analysis of Financial Condition and Results of Operations” in this Annual Report on Form 10-K for additional discussion related to research and development costs. We manufacture all of our products in 11 manufacturing facilities, two of which are located in each of Maple Plain, Minnesota and Raleigh, North Carolina, and one of which is located in each of Rosemount, Minnesota; Plymouth, Minnesota; Telford, United Kingdom; Feldkirchen, Germany; Eschenlohe, Germany; Rusko, Finland and Yamato-Shi, Kanagawa, Japan. These facilities and the manufacturing equipment we use would be costly to replace and could require substantial lead time to repair or replace. Our facilities may be harmed by natural or man-made disasters, including, without limitation, earthquakes, floods, tornadoes, fires, hurricanes, tsunamis and nuclear disasters. Expansion of our intellectual property portfolio is one of the available methods of growing our revenue and our profits. This involves a complex and costly set of activities with uncertain outcomes. Our ability to obtain patents and other intellectual property can be adversely affected by insufficient inventiveness of our employees, by changes in intellectual property laws, treaties, and regulations, and by judicial and administrative interpretations of those laws treaties and regulations. Our ability to expand our intellectual property portfolio could also be adversely affected by the lack of valuable intellectual property for sale or license at affordable prices. There is no assurance that we will be able to obtain valuable intellectual property in the jurisdictions where we and our competitors operate or that we will be able to use or license that intellectual property. Our corporate headquarters are located in Maple Plain, Minnesota in a facility we own encompassing approximately 95,000 square feet of office space. We also own a nearby facility encompassing approximately 35,000 square feet of manufacturing space. We lease an additional facility on a property adjacent to our headquarters that encompasses approximately 40,000 square feet of manufacturing space. The lease for this facility expires in 2017, subject to our option to renew for up to two additional five-year terms. We own a facility in Rosemount, Minnesota that encompasses approximately 130,000 square feet of manufacturing and office space. We also own a facility in Plymouth, Minnesota that encompasses approximately 170,000 square feet of manufacturing and office space. In April 2014, we purchased FineLine Prototyping, Inc. (FineLine) and assumed the leases of two facilities in Raleigh, North Carolina. The two facilities we lease are approximately 10,000 square feet each, with both leases expiring in 2018 and one of the leases having the option to extend the lease for three successive periods of five years each. We also purchased a facility in Cary, North Carolina in 2015, that encompasses approximately 77,000 square feet of manufacturing and office space. We also lease office space in Mosbach, Germany, Le Bourget du Lac, France and Novara, Italy, for sales, customer service and technical support staff. In October 2015, we purchased certain assets, including shares of select subsidiaries, of Alphaform AG (Alphaform), headquarted in Feldkirchen (Munich), Germany. As a result of the acquisition, we lease manufacturing and office facilities encompassing approximately 85,000 square feet in Feldkirchen, Germany, approximately 21,000 square feet in Eschenlohe, Germany and approximately 17,000 square feet in Rusko, Finland. Our Japan operations are headquartered in Yamato-Shi, Kanagawa, Japan (southwest of Tokyo) in a leased facility encompassing approximately 30,000 square feet of office and manufacturing space. The lease expires in November 2021 and has a cancellation clause with six months’ prior notice without penalty. Our operations have grown in Japan and we have initiated the search for a facility to support our growth in the region. On February 17, 2016, the last reported sale price of our common stock on the NYSE was $63.56 per share. As of February 17, 2016, we had 11 holders of record of our common stock. The actual number of shareholders is greater than this number of record holders, and includes shareholders who are beneficial owners, but whose shares are held in street name by brokers and other nominees. Includes 1,325,792 shares remaining available for issuance as of December 31, 2015 under our Employee Stock Purchase Plan. The following graph shows a comparison from February 24, 2012 (the date our common stock commenced trading on the NYSE) through December 31, 2015 of the cumulative total return for our common stock, the S&P 500 Index and the Russell 2000 Index. We have selected the Russell 2000 Index because the Russell 2000 Index measures the performance of the small market capitalization segment of U.S. equity instruments and we are a member company included in the Russell 2000 Index. Such returns are based on historical results and are not intended to suggest future performance. Data for the S&P 500 Index and the Russell 2000 Index assume reinvestment of dividends. We did not sell any unregistered equity securities or purchase any of our securities during the year ended December 31, 2015. The following tables set forth selected consolidated financial data for the periods and at the dates indicated. The selected consolidated statements of comprehensive income data for the years ended December 31, 2015, 2014 and 2013 and selected consolidated balance sheets data as of December 31, 2015 and 2014 are derived from our audited consolidated financial statements included in Item 8. “Financial Statements and Supplementary Data” of this Annual Report on Form 10-K. The selected consolidated statements of comprehensive income data for the years ended December 31, 2012 and 2011 and selected consolidated balance sheet data as of December 31, 2013, 2012 and 2011 are derived from our audited consolidated financial statements not included in this report. See Note 3 of Notes to Consolidated Financial Statements for an explanation of the method used to calculate net income per basic and diluted share attributable to common shareholders and weighted average shares outstanding for the years ended December 31, 2015, 2014 and 2013, respectively. We are a leading online and technology-enabled manufacturer of quick-turn, on-demand 3D printed, CNC-machined and injection-molded custom parts for prototyping and short-run production. We provide “Real Parts, Really Fast” to product developers and engineers worldwide, who are under increasing pressure to bring their finished products to market faster than their competition. We believe custom parts manufacturing has historically been an underserved market due to the inefficiencies inherent in the quotation, equipment set-up and non-recurring engineering processes required to produce custom parts. Our proprietary technology eliminates most of the time-consuming and expensive skilled labor conventionally required to quote and manufacture parts in low volumes, and our customers conduct nearly all of their business with us over the Internet. We target our product lines to the millions of product developers and engineers who use 3D CAD software to design products across a diverse range of end-markets. Our primary manufacturing product lines currently include Injection Molding (Protomold), CNC Machining (Firstcut) and 3D Printing (Fineline). We have experienced significant growth since our inception. Since we first introduced our Injection Molding (Protomold) product line in 1999, we have steadily expanded the size and geometric complexity of the injection-molded parts we are able to manufacture, and we continue to extend the diversity of materials we are able to support. Similarly, since first introducing our CNC Machining (Firstcut) product line in 2007, we have expanded the range of part sizes, design geometries and materials we can support. In 2014, we acquired FineLine to expand the number of process types we offer to include stereolithography (SL), selective laser sintering (SLS) and direct metal laser sintering (DMLS). We also continually seek to enhance other aspects of our technology and manufacturing processes, including our interactive web-based and automated user interface and quoting system. We intend to continue to invest significantly to enhance our technology and manufacturing processes and expand the range of our existing capabilities with the aim of meeting the needs of a broader set of product developers and engineers. 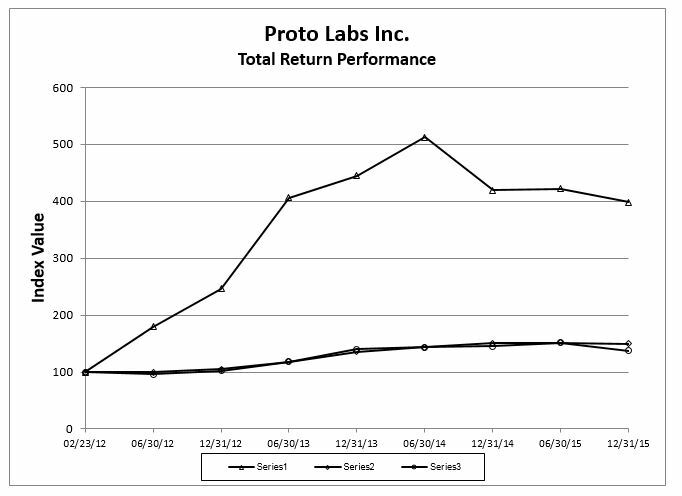 As a result of the factors described above, many of our customers tend to return to Proto Labs to meet their ongoing needs, with approximately 85%, 87% and 86% of our revenue in 2015, 2014 and 2013, respectively, derived from existing customers. We have established our operations in the United States, Europe and Japan, which we believe are three of the largest geographic markets where product developers and engineers are located. We entered the European market in 2005, launched operations in Japan in late 2009 and further expanded into Europe through our acquisition of Alphaform in 2015. As of December 31, 2015, we had sold products into approximately 60 countries. Our revenue outside of the United States accounted for approximately 27%, 26% and 27% of our consolidated revenue in the years ended December 31, 2015, 2014 and 2013, respectively. We intend to continue to expand our international sales efforts and believe opportunities exist to serve the needs of product developers and engineers in select new geographic regions. We have grown our total revenue from $98.9 million in 2011 to $264.1 million in 2015. During this period, our operating expenses increased from $32.7 million in 2011 to $87.3 million in 2015. We have grown our income from operations from $26.9 million in 2011 to $67.1 million in 2015. Our recent growth in revenue and income from operations has been accompanied by increased cost of revenues and operating expenses. We expect to increasingly invest in our operations to support anticipated future growth as discussed more fully below. Our operations are comprised of three geographic business units in the United States, Europe and Japan. Revenue is derived from our Injection Molding (Protomold), CNC Machining (Firstcut) and 3D Printing (Fineline) product lines. Injection Molding (Protomold) revenue consists of sales of custom injection molds and injection-molded parts. CNC Machining (Firstcut) revenue consists of sales of CNC-machined custom parts. 3D Printing (Fineline) revenue consists of sales of 3D-printed parts. Our revenue is generated from a diverse customer base, with no single customer company representing more than 2% of our total revenue in 2015. Our historical and current efforts to increase revenue have been directed at gaining new customers and selling to our existing customer base by increasing marketing and selling activities, offering additional product lines such as the introduction of our CNC Machining (Firstcut) product line in 2007 and 3D Printing (Fineline) through our acquisition of FineLine Prototyping, Inc. (FineLine) in 2014, expanding internationally such as the opening of our Japanese office in 2009 and through our acquisition of Alphaform in October 2015, improving the usability of our product lines such as our web-centric applications, and expanding the breadth and scope of our products such as by adding more sizes and materials to our offerings. During 2014, we served 21,552 unique product developers and engineers, an increase of 34% over the same period in 2013. Of those product developers and engineers served in 2014, 9,839 were existing product developers and engineers who had ordered from us in the past, an increase of 26% over the comparable period in 2013, and 11,713 were new product developers and engineers who ordered from us for the first time in 2014, an increase of 41% over the comparable period in 2013. We experienced strong growth in the number of unique product developers and engineers served in 2014, partially as a result of our acquisition of FineLine in April, 2014. During 2013, we served 16,128 unique product developers and engineers, an increase of 20% over the same period in 2012. Of those product developers and engineers served in 2013, 7,826 were existing product developers and engineers who had ordered from us in the past, an increase of 30% over the comparable period in 2012, and 8,302 new product developers and engineers who ordered from us for the first time in 2013, an increase of 12% over the comparable period in 2012. Our business model requires that we invest in our capacity well in advance of demand to ensure we can fulfill the expectations for quick delivery of our products to our customers. Therefore, during each of 2015 and 2014 we made significant investments in additional factory space and infrastructure in the United States. We expect to continue to grow in future periods, which will result in the need for additional investments in factory space and equipment. We expect that these additional costs for factory and equipment expansion can be absorbed by revenue growth, and allow gross margins to remain relatively consistent over time. Our recent growth in operating expenses is mainly due to higher headcounts to support our growth and expansion, and we expect that trend to continue. Our business strategy is to continue to be a leading online and technology-enabled manufacturer of quick-turn, on-demand 3D printing, CNC-machined and injection-molded custom parts for prototyping and short-run production. For us to achieve our goals, we anticipate continued substantial investments in technology and personnel, resulting in increased operating expenses. General and administrative. General and administrative expense consists primarily of employee compensation, benefits, stock-based compensation, professional service fees related to accounting, tax and legal, and other related overhead. We expect general and administrative expense to increase in the future as we continue to grow and expand as a global organization. Other income (expense), net primarily consists of foreign currency-related gains and losses, interest income on cash balances and investments, and interest expense on borrowings. Our foreign currency-related gains and losses will vary depending upon movements in underlying exchange rates. Our interest income will vary depending on our average cash balances during the period, composition of our marketable security portfolio and the current level of interest rates. Our interest expense will vary based on borrowings and interest rates. Our revenue increased $54.5 million, or 26.0%, for 2015 compared with 2014. By geographic region, this revenue growth was driven by a 24.4% increase in United States revenue and a 30.8% increase in international revenue. By product line, this revenue growth was driven by a 16.5% increase in Injection Molding (Protomold) revenue and a 24.1% increase in CNC Machining (Firstcut) revenue, in each case for 2015 compared with 2014, as well as a $15.7 million increase in revenue from 3D Printing (Fineline) and $1.2 million in Other revenue through our acquisition of Alphaform. Our revenue increases were primarily driven by increases in sales personnel and marketing activities. Our sales personnel focus on gaining new customer accounts and expanding the depth and breadth into existing customer accounts. Our marketing personnel focus on marketing activities that have proven to result in the greatest number of customer leads to support sales activity. International revenue was negatively impacted by $7.5 million in 2015 compared to 2014 due to strengthening of the United States dollar relative to the British Pound and Japanese Yen, as well as the strengthening of the British Pound relative to the Euro. The effect of pricing changes on revenue was immaterial for 2015 compared to 2014. Gross Profit and Gross Margin. Gross profit increased from $128.4 million, or 61.3% of revenues, in 2014 to $154.4 million, or 58.5% of revenues, in 2015 primarily due to increasing revenue growth as noted above. Gross margin decreased primarily as a result of our 3D Printing (Fineline) product line having a lower gross margin than our CNC Machining (Firstcut) and Injection Molding (Protomold) product lines, revenue earned through our acquistion of Alphaform having lower gross margins than our legacy operations, the cost of increased capacity, which has not been fully leveraged, and the impact of fluctuations in foreign currency exchange rates. General and Administrative. Our general and administrative expense increased $7.6 million, or 34.3%, for 2015 compared to 2014 due to an increase in headcount resulting in personnel and related cost increases of $4.4 million, facility and administrative cost increases of $1.5 million, professional service cost increases of $0.7 million for outside legal and accounting services, stock-based compensation cost increases of $0.8 and intangible amortization expense of $0.2 million. Provision for Income Taxes. Our income tax provision increased $2.4 million for 2015 compared to 2014 due an increase of taxable income. Our effective tax rate increased marginally to 31.5% in 2015 from 31.2% in 2014 due primarily to the mix of revenue earned in domestic and foreign tax jurisdictions and deductions for which we qualify in the current year. Our revenue increased $46.5 million, or 28.5%, for 2014 compared with 2013. By geographic region, this revenue growth was driven by a 30.2% increase in United States revenue and a 23.8% increase in international revenue. By product line, this revenue growth was driven by a 21.9% increase in Injection Molding (Protomold) revenue and a 24.7% increase in CNC Machining (Firstcut) revenue, in each case for 2014 compared with 2013, as well as $9.4 million in revenue from the FineLine acquisition. Our revenue growth in 2014 was the result of increased volume of the product developers and engineers we served. During 2014, we served 21,552 unique product developers and engineers, an increase of 34% over 2013. Average revenue per product developer or engineer decreased 4% during 2014 as compared to 2013. In addition to revenue gained through the acquisition of FineLine, our revenue increases were primarily driven by increases in sales personnel and marketing activities. Our sales personnel focus on gaining new customer accounts and expanding the depth and breadth into existing customer accounts. Our marketing personnel focus on marketing activities that have proven to result in the greatest number of customer leads to support sales activity. International revenue was negatively impacted by $0.1 million in 2014 compared to 2013 due to strengthening of the United States dollar relative to certain foreign currencies. The effect of pricing changes on revenue was immaterial for 2014 compared to 2013. Cost of Revenue. Cost of revenue increased $19.8 million, or 32.2%, for 2014 compared to 2013, which was greater than the rate of revenue increase of 28.5% for 2014 compared to 2013. The increase in cost of revenue was due to raw material and production cost increases of $5.8 million to support increased sales volumes, equipment and facility-related cost increases of $3.5 million and an increase in direct labor headcount resulting in personnel and related cost increases of $10.5 million. Gross Profit and Gross Margin. Gross profit increased from $101.7 million, or 62.4% of revenues, in 2013 to $128.4 million, or 61.3% of revenues, in 2014 primarily due to increasing revenue growth as noted above. Gross margin decreased primarily as a result of our 3D Printing (Fineline) product line having a lower gross margin than our legacy CNC Machining (Firstcut) and Injection Molding (Protomold) product lines and the cost of increased capacity, which has not been fully leveraged. Marketing and Sales. Marketing and sales expense increased $6.8 million, or 30.2%, for 2014 compared to 2013 due to an increase in headcount resulting in personnel and related cost increases of $4.9 million and marketing program cost increases of $1.9 million. The increase in marketing program costs is the result of our focus and concentration on funding those programs which have proven to be the most effective in growing our business. Research and Development. Our research and development expense increased $4.7 million, or 40.0%, for 2014 compared to 2013 due to an increase in headcount resulting in personnel and related cost increases of $4.0 million and other operating cost increases of $0.7 million. General and Administrative. Our general and administrative expense increased $6.0 million, or 36.9%, for 2014 compared to 2013 due to an increase in headcount resulting in personnel and related cost increases of $2.1 million, facility and administrative cost increases of $1.4 million, professional service cost increases of $1.3 million for outside legal and accounting services, stock-based compensation cost increases of $0.7 million and intangible amortization expenses of $0.5 million. Other Income, Net. Other income, net decreased $0.3 million for 2014 compared with 2013 due to $0.4 million in unfavorable changes in foreign currency rates partially offset by $0.1 million increase in interest income. Provision for Income Taxes. Our income tax provision increased $2.6 million for 2014 compared to 2013 due to an increase of taxable income. Our effective tax rate decreased marginally to 31.2% in 2014 from 31.6% in 2013 due primarily to the mix of revenue earned in domestic and foreign tax jurisdictions and deductions for which we qualify in the current year. The following tables set forth selected unaudited quarterly results of operations data for 2015 and 2014. This unaudited quarterly information has been prepared on the same basis as our annual audited consolidated financial statements appearing elsewhere in this Annual Report on Form 10-K and includes all adjustments, consisting only of normal recurring adjustments, that we consider necessary to present fairly the financial information for the fiscal quarters presented. The quarterly data should be read in conjunction with our selected financial data and consolidated financial statements and the related notes appearing elsewhere in this Annual Report on Form 10-K. Operating results for any quarter are not necessarily indicative of results for a full-year period, and the historical results presented below are not necessarily indicative of the results to be expected in any future period.